Four SCJs ordained to the diaconate! | Walk with us! Four SCJs ordained to the diaconate! Bishop Gali Bali lays hands on each of those to be ordained. Saturday was a day of celebration, even though we are at the start of Lent. The reason for our joy was the ordination of four SCJs who, having completed their year of regency, and making their final (perpetual) profession of vows in December, were ordained by Bishop Gali Bali of the diocese of Guntur. This is at least the third or fourth time I’ve met the bishop. My first encounter with him was in 2011, for presbyterial ordinations at his cathedral and that, by the way, was the year of my introduction to India. The ordination ceremony was slated to begin at 5:30 pm at our Gorantla minor seminary.It’s about a 20 to 30 minute drive from our novitiate house in Nambur. 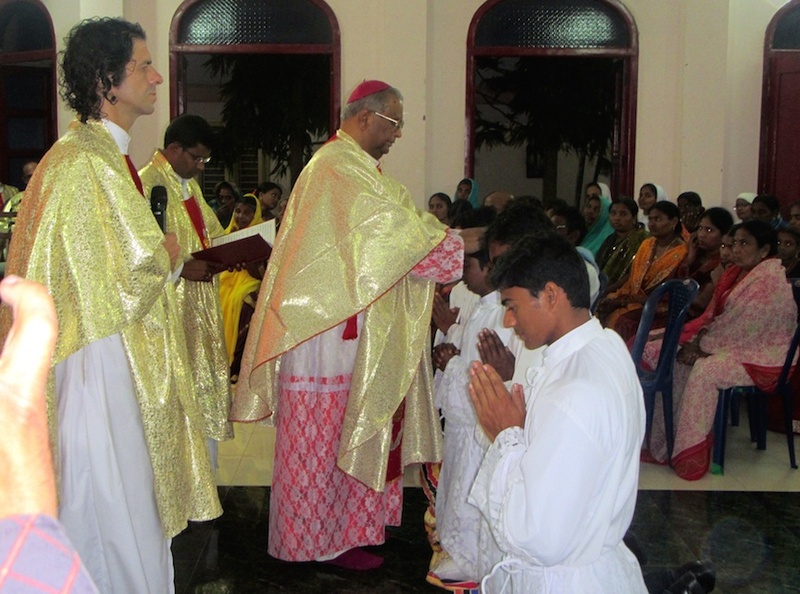 The ordinations were held there since all four deacons are from the state of Andhra Pradesh. That made it easy for family and friends to attend, as I believe all four are from around the Guntur area. I know each of the deacons but not to the same degree. I am most familiar with Dn.Ravi Kumar Dasari who did his regency at our minor seminary in Kumbalanghi. Ravi was very helpful to me during each of my stays in his community. He wass the essence of SCJ hospitality in making me feel at home and a part of his community. To a lesser degree I have spent some time with Dn. Kishore Thambi Babu who served at our other minor seminary in Gorantla. It was a good experience for the minor seminarians to see someone with whom they’ve lived and listened to for the past year advance to the order of deacon. Dn. Suresh Gottam spent his regency at our Sacred Heart parish in Vempadu. Once he arrived in Vempadu it was possible for the district to establish a separate community from the seminary and made it much easier for Fr. Jojappa to serve the needs of the parish. The community is currently renting a house and, thanks to a large donation from our Northern Italian Province, is about to begin construction on a community house. Finally there is Dn. Dumala Raju whose regency was at our philosophy house of studies in Aluva in Kerala (about a half hour from Kumbalanghi). While this is the first house I ever visited in India (2011) it is the one I’ve spent the least amount of time in and therefore am not as acquainted with the community. 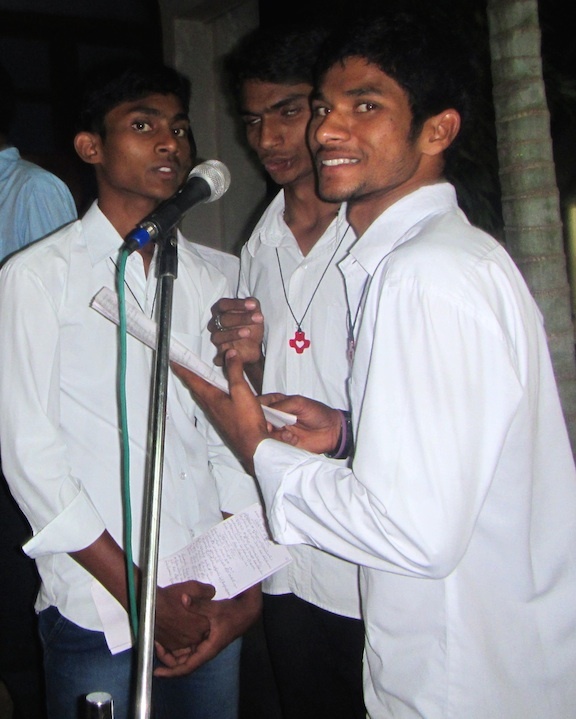 Three of the deacons will soon get pastoral assignments in the diocese of Guntur. We currently have very few SCJ parishes and with Guntur being close to both Nambur and Gorantla (as well as only about an hour and half to two hours from Eluru) using local Guntur parishes makes sense. All four deacons will be assigned as deacons through Holy Week of 2016, after which their priestly ordination will take place. Dn. Suresh, since he was already in a parish setting for his regency, will continue working in our Sacred Heart parish with Fr. Jojappa. While it is in the diocese of Eluru it is close to our other SCJ communities in Andhra Pradesh and close to his deacon classmates. Gorantla students provided the choir for the deacon ordinations as well as all the typical”‘practical” things (such as serving the guests) that go into any celebration. As for their ordination, it began almost on time. Once we priests and the other ministers and deacons lined up, our master of ceremonies for the day, Fr. Ravindra Moparthi from Nambur gave us what seemed to me to be a life history for each deacon. As practically all of the ceremony was done in Telugu I was not privy to what was said. But ever so often in each presentation I’d hear words like Kumbalanghi, Gorantla, Aluva, Nambur and Eluru so I figured he was telling us where and when each of the candidates studied and worked as regents. There is an African expression that goes something like this: “You Westerners tell time, we Africans have time.” Not far off the mark in the sense that things in Africa and here in India are not rushed, and spending three hours at a deacon ordination, well that’s the way it’s supposed to be. The music was provided by the students of Gorantla under the direction of Fr. Jijo Voice, who joined the Gorantla community last year, and Fr. Marianand Garargapu, the treasurer at the novitiate community in Nambur; and finally the keyboard was played by Fr. Abraham Lazar associate pastor at Divine Mercy Parish, Vasai (near Mumbai). It took just over two-and-a-half hours from start to finish and then we all strolled up onto the roof where the meal for the community and guests was served. The Gorantla students were responsible for set up and serving it under the direction of Fr. Michael Benedict, district treasurer and a member of the Gorantla staff, The meal was excellent and gave me more practice eating with my hands. As we had the ride home staring us in the face and ministry assignments for Sunday Fr. Mariano, six of the brothers and I piled into our mini-van and headed for home. We made it back just after 11:00 pm and soon I was in bed knowing 5:30 am would arrive soon enough, and it did!